I’m going to try this again. It isn’t quite the famous quip about insanity being repeating an action and expecting different results, but the results have not always been spectacular. Though, in my defense, that has on occasion not been my fault. 2018 – Technically, mission accomplished; reality, not so much. This time around I am going to make this less of a goal setting session, where I declare I am going to run off and play some new games… or some old games… or some games in between that I have not played before. Instead, this is going to attempt to be more predictive. Didn’t I just do predictions yesterday? 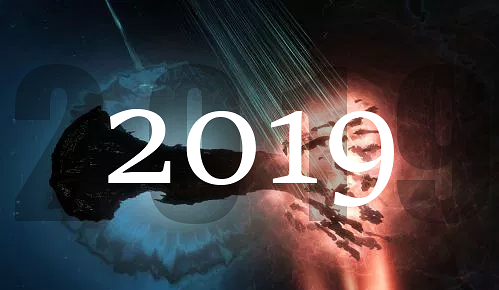 Well, I didn’t attempt to predict what I was actually going to play in 2019, so this is a different avenue. I’ll open up with the usual suspects. Pretty much a lock since I played it 12 out of 12 months in 2018. If I log in today and play, I’m covered, and it seems likely that I will do so and continue to do so over the course of the year. As long as Reavers deploy a couple of times I’m probably good. The other game I played pretty much daily throughout 2018. It helps that this is the one video game that my wife and I play together. Also happens to be the only active Pokemon title on a platform I own, since Nintendo is abandoning the handheld model and throwing everything onto the Switch. Not that I am bitter or anything. I think this one is a no-brainer. I will certainly subscribe and log in for the spectacle that will be the launch of WoW Classic. The real question is how bad will it be? I don’t mean to suggest there will be any glaring lack of fidelity. I feel Blizz will be about as true to the idea as they can be. The question will be how slammed will the servers be and how fragmented will the community end up as Blizz opens up more and more servers? This one is likely a gimme as well. While Battle for Azeroth just didn’t capture me, the fact that the same subscription will get you into both WoW and WoW Classic makes it very likely that I will log into the former to play. There will probably be a boost in people on regular WoW servers corresponding to the length of the server queues on WoW Classic. Lifetime subscription and the Legendary server… and the fact that I am still playing it right now, if not as actively as I was when the server kicked off… makes this another shoe-in for the list. I may not last once it gets past Moria, but up until then I am probably in. After those titles we get into a more gray area. Still, there are some candidates that don’t seem to be complete long shots. If things go badly for Daybreak, or if they have a good plan for the 15th anniversary of the game, it seems reasonable that I will be in for either a last look or another visit. The game I keep meaning to play seriously but somehow never quite get to. I own it already, always a plus, and it gets good marks for its quirky nature. Our server has been pretty quiet for the last year, but the panda update is coming. That might at least get me back on long enough to scout out a bamboo grove to find them. Technically not an MMO, but close enough. Titles that might happen, if certain conditions come to pass… being something other than early access garbage being a key item. I’m trying not to encourage the developer line about, “I’ll gladly ship on Tuesday if you’ll just buy my game today” by paying into that sort of thing any more. Hey, it will be the 20 year anniversary of the game shipping come March 16th. There is a distinct possibility that Daybreak will have something lined up that will make me want to log in, at least for a bit. Whether you see this as re-skinned Ark or not, a some people I know are getting into this… when it is running and you can log in… so there is the glimmer of a possibility that I might give it a try. The whole early access aspect of it will be the factor keeping me away if I don’t play it. I don’t think it will ship in 2019, and I am not going to beta test it, which is what makes it a wildcard. I’m interested to try it even if I am not amongst those publicly wetting themselves in anticipation of it. Didn’t I pay for this almost five years ago now? It would be cool if there was something there both playable and worth playing. We got the base game for free back in October and I downloaded it. So it is installed and ready to go if I decide I want to try it. Also technically not an MMO, at least by my own measure, but if maybe Blizzard were to add something fresh to the game I could find myself playing again. I enjoy it, but can only play through the story and seasons so many times. I have a bunch of time invested in both over the years. They tend to be good games for quick action, but neither hole my attention for very long either. Battles often become the same situation repeated ad infinitum. I mean, somebody is going to ship something new this year, aren’t they? Again, I don’t like to set goals, but I look at my Steam library and it there are games I know I will play and games I want to find time for. And then there are games on my wish list that maybe I might yet buy. The Steam Winter Sale still has two full days left to run. So there are some options. We’ll see at the end of the year what I ended up playing and what fell by the wayside. As like as not something else will come up mid-year and I’ll divert into that. This entry was posted in Camelot Unchained, Diablo III, entertainment, EVE Online, EverQuest, EverQuest II, Lord of the Rings Online, Minecraft, Project: Gorgon, Steam, War Thunder, World of Tanks, World of Warcraft, WoW Classic and tagged 2019 on January 2, 2019 by Wilhelm Arcturus. SuperData Research has their numbers for March out and it shows an unexpected (at least to me) change with some of the usual suspected. League of Legends lost its first place spot on the PC list. If you go to the SuperData tag here and scroll down the past posts, you will see that League of Legends has held that spot since the list was a thing. It has been there for so long it seemed like it was just locked in place. 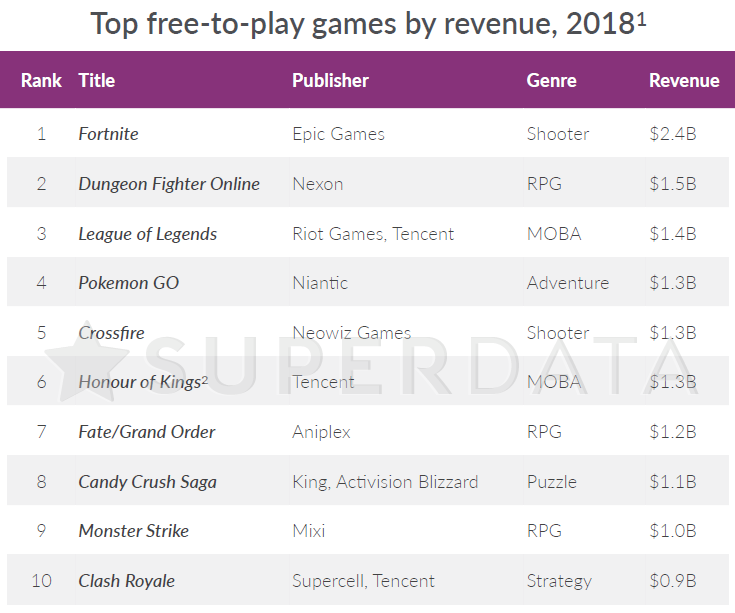 Of course, it was supplanted by Dungeon Fighter Online, a Korean game big in the China market that has been hanging around second or third position for as long as LoL has been in first place. I’m not sure if League of Legends is sagging a bit or if the Season 4 release for Dungeon Fighter Online was that popular, but we have a new player in first position for now. Further down the list Fortnite pushed into fifth spot while PlayerUnknown’s Battlegrounds, fifth last month, dropped down to seventh place behind World of Warcraft. World of Tanks held on to the eighth slot while Far Cry 5 joined at ninth, taking that spot from Hearthstone, and CS:GO held on to tenth. On the console list Fortnite broke into the number one spot in March, followed by popular new comer Far Cry 5, pushing down FIFA 18, Call of Duty WWII, and the long in the tooth GTA V. Sea of Thieves also hove into view on the list while Monster Hunter: World fell from fourth to tenth spot. And on the mobile list Pokemon Go and Candy Crush Saga swapped positions compared to the February list. It seems like things are still full speed ahead for Fortnite and their conquest of the battle royale genre. Dungeon Fighter Online has generated the highest revenue of any Free-to-Play PC game in March on the back of their third anniversary celebration and a limited event that challenged players to level up new characters for special items. Tencent’s mobile kart-racing game, QQ Speed, has generated over $100M in revenue for its third month in a row. 2015’s Call of Duty: Black Ops III continues to hold an impressive audience despite being two iterations behind this year’s Call of Duty: WWII. Developer Activision is continuing support for the game, releasing a new mode and map this month. Fortnite had quite a March. 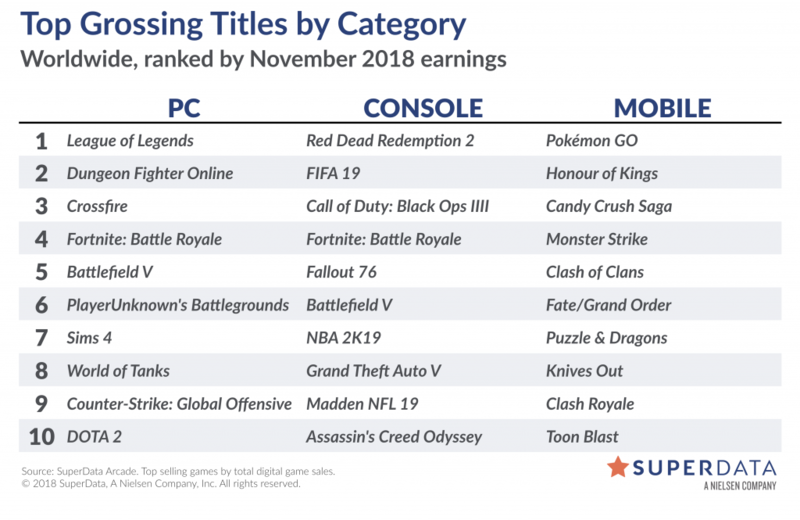 The game has overtaken the previous “king of battle royale,” PUBG, in terms of revenue generated and monthly active users across all platforms. It also hit the #1 spot by revenue on iOS in the United States in its launch month and has the highest conversion rate of any free-to-play PC game in March. There’s no other way to say it: the game is a phenomenon. Fortnite generated $223 million across all platforms (console, PC, Mobile) in March, up a whopping 73% from February. Drake, a new season of the Battle Pass, and a John Wick skin all contributed to the massive growth. This entry was posted in entertainment, SuperData Research, World of Tanks, World of Warcraft and tagged Fortnite, League of Legends, PlayerUnknowns Battleground on April 26, 2018 by Wilhelm Arcturus. The February digital revenue numbers from SuperData Research are out and they show what SuperData has already been going on about; the rise of Fortnite. 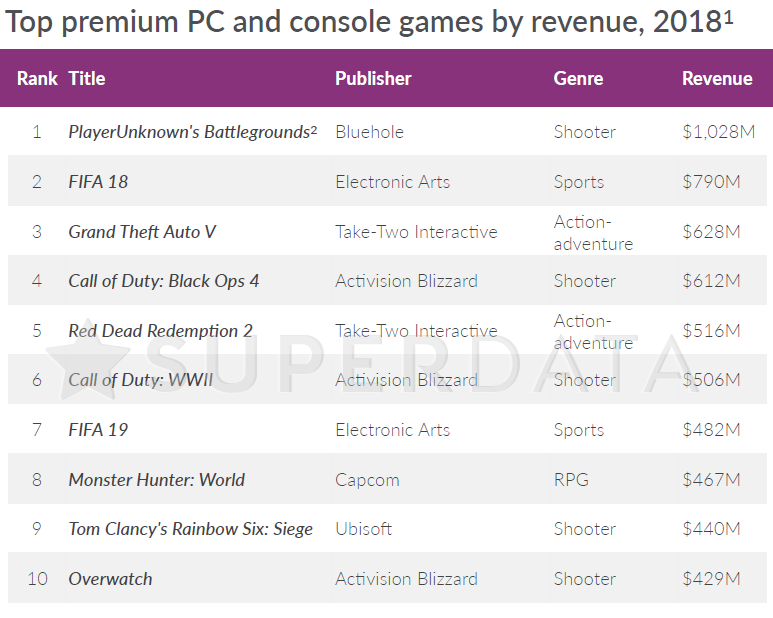 On the PC side of things Fortnite is still behind PlayerUnknown’s Battlegrounds, but that is PUBG’s strong spot. On the console side of thing Fortnite is alone in third position with PUBG nowhere to be seen. And when it comes to live stream viewership, the metric of the hour, Fortnite owns. On the PC side of things both games kept ahead of World of Warcraft on the revenue front. World of Tanks, which just saw a big update, tucked in behind WoW, displacing CS:GO, which fell to tenth, while ninth position saw Hearthstone pop up onto the list. We’ll see next month if World of Tanks benefits from the update. 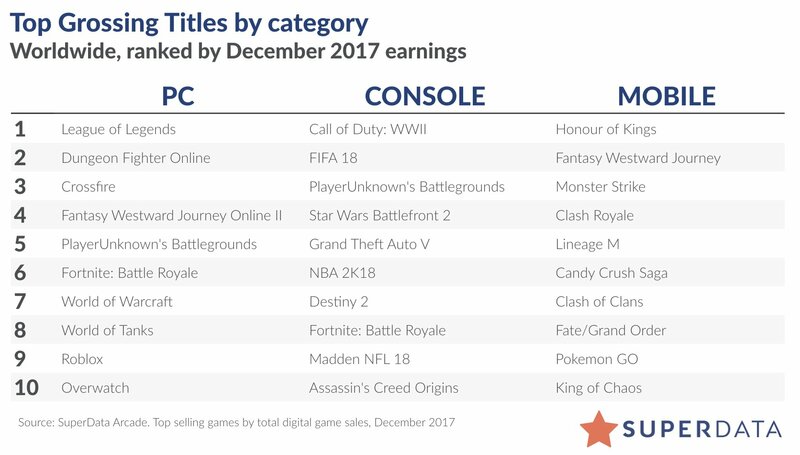 On the console side list Call of Duty: WWII continued to hold the top spot, while FIFA 18 and Fortnite both pushed ahead of Monster Hunter World. The long on the list GTA V held on in fifth position. And on the mobile list Candy Crush Saga stayed in fourth place while Lineage M dropped one position to eighth and Pokemon Go moved up to ninth. Both PUBG and Fortnite have their own mobile versions on the way so the battle between these titles may eventually expand to all three lists on the chart. U.S. digital spending grows 21%. Growth came primarily from an increase in Console spend, from both large premium AAA franchises and the popularity of the Free-to-play Fortnite. Combined with the increase in Premium PC, these segments more than offset continued declines in Pay-to-Play PC and Social. Fortnite continues its upward trajectory. Epic’s Battle Royale title showed no signs of losing steam. Fortnite earned more additional content revenue on console than any game other than Call of Duty: WWII and now has more monthly active users than Grand Theft Auto V.
PlayerUnknown’s Battlegrounds sells over 2.5 million digital units. PC unit sales declined for a second month in a row but continued purchases on Xbox One made up for some of the lost ground. Tencent’s QQ Speed cements itself as a top 10 mobile game. QQ Speed, which launched in December, has shown one of the fastest climbs of any mobile title we’ve seen, and points to just how fast new mobile games can aggregate tens of millions of players. Overwatch continues to hold buyers through back-to-back cosmetic releases, despite heavy competition for the consumer’s dollar from popular Battle Royale titles. January introduced Overwatch League themed cosmetics and February saw the release of cosmetics related to Chinese New Year. Monster Hunter World continues to see great success in its first 30 days of release, due to overwhelmingly positive reviews and news. This entry was posted in entertainment, SuperData Research, World of Tanks, World of Warcraft and tagged Fortnite, PlayerUnknowns Battleground on March 29, 2018 by Wilhelm Arcturus. SuperData Research released their numbers for December 2017. PlayerUnknown’s Battlegrounds, which was in second place on the PC chart for November, slipped down to fifth place. Still, anybody who can say, “Made more money that WoW this month!” is probably not going to complain too loudly. And they can always point to the console chart where PUBG made it up to third position via its release on XBox. That move saw the Chinese trio of Dungeon Fighter Online, Crossfire, and Fantasy Westward Journey Online II return to slots 2, 3, and 4, with League of Legends undisturbed in first place yet again. Some day it will fall. Fortnite, having dropped all that co-op game play that was their initial pitch to jump on the Battle Royale bandwagon, jumped to sixth place, above WoW, which held on to seventh position for another month. World of Tanks moved up to eighth, while Roblox and Overwatch returned to the bottom list. Displaced from the PC chart were Destiny 2, Call of Duty: WWII, and Star Wars Battlefront II, which were 6, 8, and 10 on the list last month. 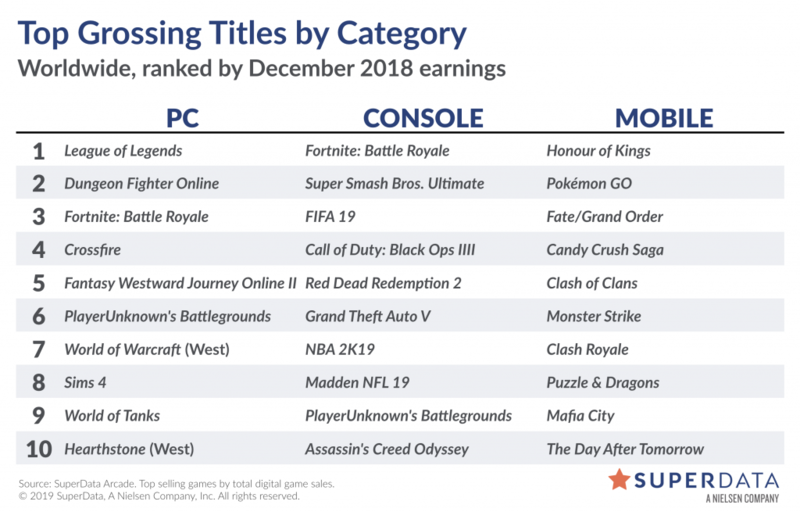 On the console list, as noted, PUBG arrived on XBox and vaulted into third spot, while Fortnite, which came to consoles the month before, held on to eighth position. And on the mobile chart Pokemon Go made it back onto the list, slotting into ninth, while Candy Crush Saga held on at sixth position. Global digital games market saw an incredible holiday quarter, up 19% from 2016. Worldwide digital spending grew 17% in December. Gamers spent almost $10 billion digitally on games across all platforms in December. Growth came primarily from an increase in Premium PC, Console, and Mobile. Destiny 2’s new DLC release, Curse of Osiris, failed to make a significant impact on the game. MAU and digital revenue were generally flat month-over-month. PLAYERUNKNOWN’s Battlegrounds’ success continues and competitors respond. XBox owners waited patiently for PUBG to make its way on console and responded by buying more than 2 million digital units during launch month. Meanwhile, mobile PUBG clones Knives Out and Rules of Survival both have had successful launches. Call of Duty WW2 ended the year on a high note. The new Call of Duty had the best quarter of digital unit sales ever for a console title. Grand Theft Auto V set another record month. GTA V Online broke its previous revenue record back in June 2017, making it the title’s best month to date for its multiplayer segment. Fortnite Battle Royale earned $89 million in December. Epic Games’ entry into the Battle Royale arena continues to reach new heights on both console and PC, with a close-to-even audience split on both platforms. This entry was posted in entertainment, SuperData Research, World of Tanks, World of Warcraft and tagged PlayerUnknowns Battleground on January 25, 2018 by Wilhelm Arcturus.